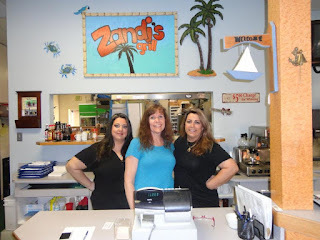 Chef Robert Irvine visits Zandi's Grill in Millersville, Maryland and after struggling to find the restaurant is met with the challenge of poor quality food, poor service and a very dated decor. Owners sisters Yvonne and Evette have fallen out of love of running a restaurant and are allowing the place to fall apart, both the restaurant and the owners need Robert's help. Robert revisits the restaurant and finds that business is up 39%, they are serving over double the customers they were previously each day. They have kept Roberts new décor and the spirit of his menu by keeping it small with fresh ingredients. They closed in February 2014, reviews prior to closing were mixed.